GourMel Catering’s menus are is perfect for morning meetings, business lunches and receptions. Delivered directly to your place of business, these menus are prepared to travel and to be displayed on-site with our concierge set-up. Each order includes disposable, garnished trays and serve ware ready to be presented upon arrival, with no additional preparation. What could be more simple than that? Business events and celebrations are unique in their own right – never is it more important to manage the atmosphere and experience through the tactile experiences of food, setting, décor and flow. This is where GourMel Catering’s culinary team flourishes – creating a sense of excitement and fun in a setting appropriate for conducting business among professional colleagues. GourMel Catering takes traditional catering up a notch, with personalized touches that speak directly to a business-minded audience. 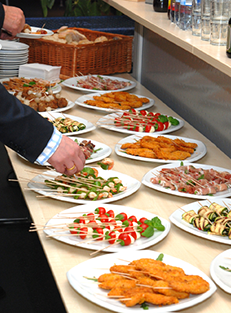 GourMel Catering is adept at catering to corporate clients and non-profit organizations. We know that your event needs to go flawlessly. Realize your vision with our top-of-the-line menus and elegant service.